by various sources - Wikipedia, 04-05-2009. (Syriac: ܦܪܡܬܐ ܕܣܡܠܐ: Premta d-Simele) was the first of many massacres committed by the Iraqi government during the systematic targeting of Assyrians of Northern Iraq in August 1933. The term is used to describe not only the massacre of Simele, but also the killing spree that continued among 63 Assyrian villages in the Dohuk and Mosul districts that led to the deaths of an estimated 3,000 innocent Assyrians. The Assyrian people at the time were emerging from one of the darkest periods of their history the Assyrian genocide at the end of the World War I, an estimated two-thirds of their population was massacred by Ottoman Turks and Kurds. In early August 1933, more than 1,000 Assyrians who had been refused asylum in Syria crossed the border to return to their villages in Northern Iraq. The French, who at the time were controlling Syria, had notified the Iraqis that the Assyrians were not armed; but while the Iraqi soldiers were disarming those whose arms had been returned, shots were fired resulting in 30 Iraqi and Assyrian casualties. Anti-Assyrian and Anti-British xenophobia, apparent throughout the crisis, accelerated. Reports circulated of Assyrian mutilation of Iraqi soldiers (later proven to be false). In Baghdad, the government panicked, fearing disaster as the Assyrians presented a formidable fighting force that could provoke a general uprising in the north. The government unleashed Kurdish irregulars who killed some 120 inhabitants of two Assyrian villages in the week of August 2 to August 9 (with most of the massacre occurring on August 7). Then on August 11, Kurdish general Bakr Sidqi (who had clashed with Assyrians before) led a march to what was then one of the most heavily inhabited Assyrian area in Iraq, the Simele district. The Assyrian population of the district of Simele was indiscriminately massacred; men women, and children. In one room alone, eighty one Assyrians of Baz tribe were massacred. 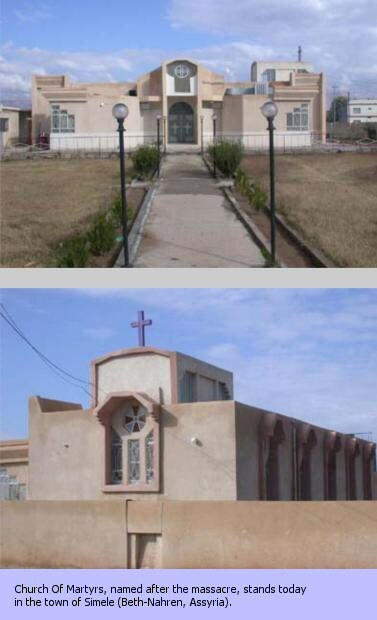 Religious leaders were prime targets; eight Assyrian priests were killed during the massacre, including one beheaded and another burned alive. Girls were raped and women violated and made to march naked before the Muslim army commanders. Holy books were used as fuel for burning girls. Children were run over by military cars. Pregnant women were bayoneted. Children were flung in the air and pierced with bayonets. Back in the city of Dohuk, 600 Assyrians were killed by Sidqi's men. From the nationalists’ point of view, the Assyrian levies were British proxies, to be used by their ‘masters’ to destroy the new Iraqi state whose independence the British had consistently opposed. The British allowed their Assyrian auxiliary troops to retain their arms and granted them special duty and privileges: guarding military air installations and receiving higher pay than the Iraqi Arab recruits. Under British protection, the Assyrians did not become Iraqi citizens after independence. The nationalists believed the British were hoping for the Assyrians to destroy Iraq’s internal cohesion by becoming independent and by inciting others such as the Kurds to follow their example. The massacre would eventually lead to 15,000 Assyrians leaving the Nineveh Plains for neighboring French Mandate of Syria, and create 35 new villages on the banks of the Khabur river. August 7 officially became known as Martyrs Day or National Day of Mourning by the Assyrian community in memory for the Simele massacre, as it was declared so by the Assyrian Universal Alliance in 1970. In 2004, the Syrian government banned an Assyrian political organization from commemorating the event, and threatened arrests if any were to break the ban. The Simele massacre inspired Raphael Lemkin to create the concept of "Genocide". In 1933, Lemkin made a presentation to the Legal Council of the League of Nations conference on international criminal law in Madrid, for which he prepared an essay on the Crime of Barbarity as a crime against international law. The concept of the crime, which later evolved into the idea of genocide, was based mostly on the Simele massacre. International Federation for Human Rights — "Displaced persons in Iraqi Kurdistan and Iraqi refugees in Iran", 2003. Joseph Yacoub, La question assyro-chaldéenne, les Puissances européennes et la SDN (1908–1938), 4 vol., thèse Lyon, 1985, p. 156. Iraq Between the Two World Wars: The Militarist Origins of Tyranny, Reeva S. Simon, 2004. "Modern Aramaic Dictionary & Phrasebook" By Nicholas Awde. Page 11. Majed Eshoo, "The Fate Of Assyrian Villages Annexed To Today's Dohuk Governorate In Iraq"
Good Morning Assyria, Zinda Magazine. Seventy Thousand Assyrians, William SAROYAN, WikiQuotes. The Man Who Invented Genocide: The Public Career and Consequences of Raphael Lemkin, by James Joseph Martin. Page 166. 1984. Raphael Lemkin — EuropeWorld, 22/6/2001.